Chloe is modeling a new dress I purchased for her from Den of Angels member Spampy. 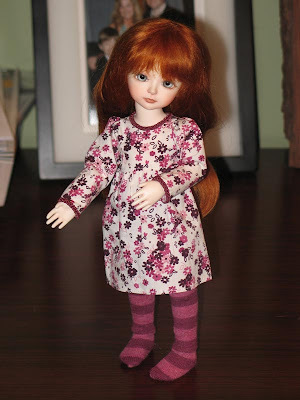 She makes adorable and very reasonably priced clothes for tiny BJDs. I was going to make all of her clothes myself, but who could say no to this adorable dress and tights. I did make her a tiny bear this past weekend though! It is the smallest bear I have made in a LONG time. I also made another tiny bear this weekend for Chloe's Secret Santa partner...Shhh! Don't tell!